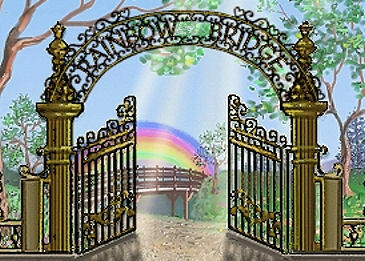 Rainbow Bridge - A PetLoss Grief Support Community. Pet Bereavement and Memorial support for coping with the death of a loving fur baby. Rainbows Bridge is a virtual memorial home and grief support community for your departed fur baby. Whether furry, feathered or scaled, all are welcome. Create a Pet Memorial and return as often as you wish to leave new toys, flowers and music, add photos, change seasons and leave more special memories. Invite friends to visit and post your memorial on Facebook. Or send a gift certificate to a friend whose pet has passed. Each Monday at 9PM Eastern we honor fur babies who have gone to Rainbow Bridge. Create a Candle Tribute for your pet and join us at the online Ceremony. The ceremony is a celebration of life. A listing of all Memorials. You can search listings by breed, name, city, state or zip code. Pet Memorial stones, Personalized Jewelry and Ornaments, Rainbow Bridge Poems and more. Begin the healing of your broken heart after the passing of a beloved Pet. There are chat rooms, forums and reading resources. Find answers to many questions, such as "How long will the pain last". Share your poems & stories about a beloved pet and browse our collection from fellow visitors. The Rainbow Bridge Poem and accompanying Pin is an affordable and beautiful Tribute to a beloved fur child. Send a friend an E-Sympathy Pet Card a friend to let them know you care and understand the emotional pain of their loss. At New Beginnings the focus is on how to provide the best care for those Furry Friends still sharing their days with you. Volunteer to send a condolence, offer help at the pet loss chat, email an e-sympathy pet card. A good heart and caring soul are required. A portion of all purchases made at Rainbow Bridge are donated to no-kill animal rescue shelters. Log in to care for your beloved pets memorial or retrieve your Guardian login information.